We’d love your help. Let us know what’s wrong with this preview of Dirty Rubles by Greg Olear. Trump/Russia is the greatest political scandal in American history. It’s also the most complex. In this remarkable and necessary work, novelist Greg Olear weaves the loose threads of Trump/Russia into a short, easy-to-follow narrative. 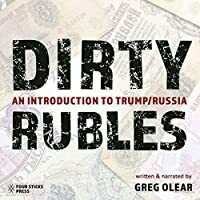 Dirty Rubles is an ideal primer for those new to the story, a useful review for those already in the know, and a guidebook for the agnostic Trump/Russia is the greatest political scandal in American history. It’s also the most complex. In this remarkable and necessary work, novelist Greg Olear weaves the loose threads of Trump/Russia into a short, easy-to-follow narrative. Dirty Rubles is an ideal primer for those new to the story, a useful review for those already in the know, and a guidebook for the agnostic #MAGA fan—a compelling overview of Trump/Russia that every American should read. "If ignorance is your bliss, Dirty Rubles isn't for you. Greg Olear deliciously tears down that barrier Trump has erected between the truth and the American people. To ask other readers questions about Dirty Rubles, please sign up. A lightning fast yet detailed read providing an excellent summation of the insanity we find ourselves in right now, spanning 2016 to last month. And yes, I read it with a hi-lighter poised to keep track of all the lied-about meetings, contacts, shady business deals, etc. Of course I did. Highly recommended. Very good, up to the minute report on current events. Recommend! This book is a Cliff’s Notes of the Trump Russia connection. It connects the dots between various factual actions taken by Trump associates and the conspiracy perpetuated against the citizens of the United States. Some of the connecting lines are razor sharp, some blurred, and some speculatively dotted. In the end, a single candlelight of truth will not be extinguished by a world of dark lies. Promote it, love it and want everyone to read it. A quick and dirty summary of the Trump/Russia scandal. He touches on all the major points and players. If you don’t want a major time investment this is a good start. Personally, I would suggest Russian Roulette. I think he’s got a fair bit of bias against Comey and Obama, and that it isn’t really justified. And since I am listening to the audio I am knocking off a full star for his narration. It is juvenile and hurts his credibility. A fantastic summary of events. If you haven't been keeping up, a good way to catch up. If you have been keeping up, a good way to review. I needed this simply to confirm that the pieces I had been putting together still fit together the way I thought they did. Greg Olear is a hero. A very short summary that could have been a New Yorker article, if the obscenities were removed, but costing $9. The small fraction that you haven't already heard is conjecture. 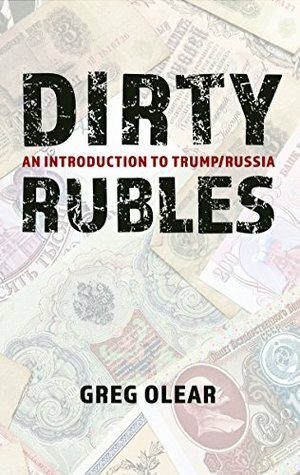 New book Dirty Rubles: An Introduction to Trump/Russia is a primer on the greatest political scandal in US history. “While Donald Trump represented the greatest threat New book Dirty Rubles: An Introduction to Trump/Russia is a primer on the greatest political scandal in US history. —Eric Garland, strategic analyst, author of Future Inc: How Businesses Can Anticipate and Profit from What’s NEXT and How to Predict the Future and Win. Author of the novels Fathermucker and Totally Killer.